Delish recipes from an evening with friends, simple ingredients cooked on an open fire and a shoreline setting that is elixir for the soul. They're buff, they're trained, and they're ready. A look inside the world of the Coast Guard chopper-rescue teams stationed in Traverse City. Country music star and runner up on The Voice on what's next and what Northern Michigan means to her. There's enough beauty and adventure in this national park to fill a lifetime of trips. We get you started. We take a lesson from the timeless Carleton Varney-- the decorator behind the Grand Hotel's signature interiors. Pink stripes and geraniums anyone? Beaver Island Boat Company's new captain, summer reads with a not to ou mitten state, TC Whiskey's cocktain cherries, Line 5 update, you got this Kirtland's warblers! Hang out with us online, in social and at MyNorthTickets! Summer's heating up! Here's where to get on it. Beach towns to bliss-out in. The Fourth of July in a tiny tiner in tiny Grand Marais. Whew! Dinner with a side of watery view. Recipe: Beach Bruschetta with Goat Cheese & Infused Honey. Northern Michigan rosé, all day! Discover the down-under with a snorkel. The wisdom of land conservancies. The screen doors in our house slam when they shut. They are not the kind of doors that go quietly into the night, gliding gracefully to a soft landing. We have the springs attached, but still, they smack, wood on wood, all summer long. Women wince. Every man new to our house says, after about an hour, “I can fix that for you.” But here’s the truth—I don’t want them fixed. ... Read the rest of Deborah Wyatt Fellows's column to discover the magic of owning a home in Northern Michigan. 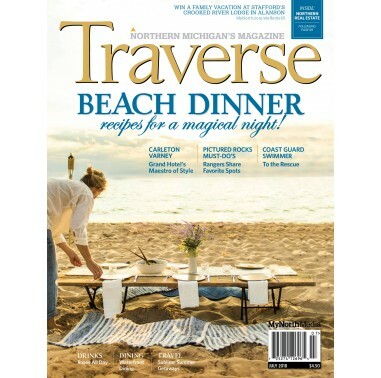 For a collection of Deborah Wyatt Fellows's most popular and treasured columns, including "Slices of Heaven" and accompanied with Traverse, Northern Michigan's Magazine's gorgeous photography, order a copy of her book, Reflections of a Life Up North, by clicking here. Mapping out a wedding? Check out MyNorth Wedding for beautiful Up North wedding ideas. MyNorth.com/wedding.